The United States Coast Guard said 13 people were rescued from a 106-foot yacht that sank in the waters off Fort Lauderdale Monday evening, reports CBS Miami. 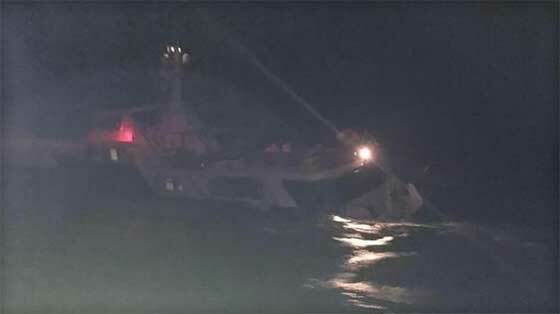 The Serena III yacht sent out a distress call shortly before 6 p.m. on Monday about the boat taking on water, according to Sea Tow Marine Towing and Salvage. Less than two hours after that the yacht was gone. "It just gradually took on more and more water and then it went down by the stern and rolled," said Sea Tow Captain Tim Morgan to CBS Miami. "Then it went under the waves." The Coast Guard says the yacht sank about 13 miles east of Sunrise Boulevard in Fort Lauderdale, Florida. CBS Miami reports that the Coast Guard was able to rescue everyone on-board minutes before it sank. There are no reports of injuries. Morgan told CBS Miami it appeared a mechanical problem might be to blame. He said it's fortunate that the ship was relatively close to shore so Coast Guard could rescue passengers. In the dark, with water rushing on board the yacht, Morgan said it was impossible to save. "The amount of water it was taking and how quickly the boat sank, really, I don't think much anybody would have been able to do," Morgan said. The Coast Guard continues to investigate the sinking.